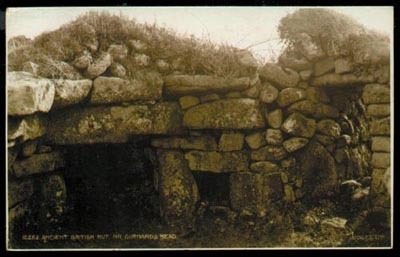 The original purpose of the beehive hut at Bosporthennis is uncertain and Craig Weatherhill suggests the possibility of its being a type of overground fogou.1 A H Allcroft, writing in 1908,2 regards the structure as possibly the most perfect specimen now remaining in England and decribes it as "a double hut of two rooms, one circular, the other rectangular. The circular room has a diameter of 13 feet, and the other measures but 9 feet by 7 feet. In the wall of the latter, 4 feet from the ground, is a window about 12 inches square. The doorways, with their lintels and jambs, are in excellent preservation, and the principal entrance faces to the south-west. Huts of this type, rare in England, are more frequent in Ireland, where they are popularly believed to be hermits' cells, the rectangular chambers passing for oratories. 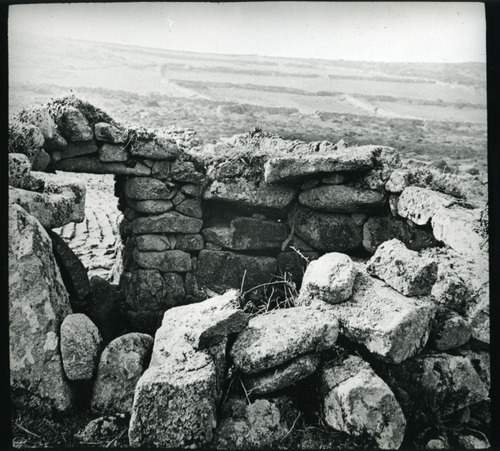 This Cornish example may be of similarly late date, or the rectangular chamber may be a later addition made in Christian times to an older hut then rebuilt and repaired." The window mentioned by Allcroft is certainly thought to be relatively modern. Image courtesy of and © David Thomas. Two real photographic postcard views of the beehive hut at Bosporthennis by Judges of Hastings. Sabine Baring-Gould, who penned the hymn 'Onward Christian Soldiers', in describing the construction method of such structures states3 that "A circle was described in the grass, in diameter from 6 feet to 9 feet. Then a second circle, concentric, 3 feet beyond the first, that is to say, with a diameter 12 to 15 feet. Stones were set up on end in the ground where these circles had been described, and these uprights, their interstices filled in with moss and turf. 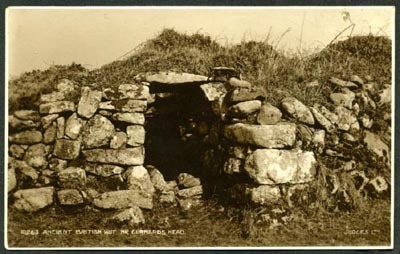 After the walls had been carried to the height of four feet, the horizontal courses were drawn together inwards, so as to form a dome of overlapping slabs, and in the centre an opening was left to admit light and to serve as a smoke-hole, but sufficiently small to be easily closed with a stone or a wad of turf. On the south side of this bee-hive habitation a door was contrived by planting two jambs in the soil at right angles to the walls, standing about 2 feet 6 inches high, and placing over these a broad flat slab as lintel, on which the structure of the dome could be continued, and could rest." 1. Weatherhill, Craig. 1981. Belerion: Ancient Sites of the Land's End. Alison Hodge. 2. Allcroft, A Hadrian. 1908. Earthwork of England: Prehistoric, Roman, Saxon, Danish, Norman and Mediæval. MacMillan and Co Ltd.
3. Baring-Gould, Sabine. 1892. Strange Survivals. Methuen and Co.